The sphere in which a woman can express her femininity is narrow to a certain extent, because it is restricted to her marital life where her role as a female is mainly revealed, and to her family and feminine milieu where she can show her feminine traits through wearing ornaments or whatever… not to mention motherhood that is the most important feminine role that a woman fulfills. But motherhood itself is not purely a feminine role; all the more so it is a human role in a woman’s life. Thus, the role of a woman as a human being remains her most essential role in life. She must confirm, in her actions, that she is a person of reason, a person of will, a person of affection, and a person who has a mission to carry out and she should prove that she has the ability to take part in life. So, women’s humanity is the most important aspect in their personality because it is the aspect that symbolizes the aim God created them to achieve in this world. He created women to contribute to the existence with the faculties they have, just as He created men to contribute to the existence with the abilities they possess. Therefore, we believe that, while the feminine aspect of the woman’s personality is revealed in a delimited sphere, her human aspect is manifested in her whole existence as a woman. Even more, the human aspect of her personality will indeed be integrated with the feminine aspect of her conduct as a female, whether with her husband or within her own specific sensations of femininity. Verily, the aspect of humanity in her will enrich that conduct turning it into a nobler one, and will expand her giving to the partner that she joins in marriage. In other words, it is an aspect that refines the instinct and humanizes it in deeds as well as in feelings, so that the marital relationship will no longer be a relationship in which the female provides the male with her biological drives. It will rather be a human relationship where each partner, male or female, makes use of his distinguishing characteristics in order to give the other what pleases him and what satisfies both his emotional and his physical needs. Among the various questions that are sent to our website on a daily basis, whose answers are provided by a dedicated team of specialized experts and scholars, a series of questions have been compiled in order to give you answers and explanations regarding the issue of women. Q: Is it permissible for the mukallaf girls to ride a horse? A: That is permissible in itself, but if it is condemned by the society, then it is better to avoid it. Q: Recently, while I was surfing through the internet, I read about a strange custom which was condemned by all those who read it. This custom is "female circumcision", meaning, eliminating a part of the woman's gentile organ in order, according to their opinion, to protect her chastity and make her lose her lust because sexual appetite is confined to men only… after I read that, I condemned it and considered it as an ugly practice. I asked a woman who is experienced in religious studies and she told me that this practice is recommendable and not prohibited; her answer astonished me, besides I was not convinced by what she said. I would like you to tell me what is the opinion of the Islamic law regarding this issue? A: Female circumcision is neither obligatory nor recommendable, as it is the case for men, but it is deemed prohibited if it causes her harm to women. Q: What are the official positions in the state that are permissible for the woman to hold, and what are the positions that are prohibited for her to hold? What about being a candidate for elections? A: It is precautionary for her not to be in office of judge, although this depends on acquiring the necessary conditions. Q: In our country, there are some girls who travel on foot from their country to another one cutting a distance that takes them approximately eleven hours. Those girls walk alone without a Mahram (close relatives. those who cannot be married with, such as brother, father, son, son’s son, grandparents, uncles, father-in-law, milk brother and son, step-father and grandchildren), knowing that, on their way to the other country, there are no Muslims, but only, Hindus. This issue makes some pious men afraid that the girls may be exposed to any kind of abduction, abuse or any accident. What is the opinion of your Eminence concerning this issue? Do you have any suggestion for solving it? A: If the women’s traveling from a country to another, without the protection of men, exposes them to danger, it is prohibited for them to travel without that protection which must be provided by their families in the proper manner. Q: I am a young girl and I like to learn how to practice “Tae Kwon Do”. Is there any problem if the place of teaching this kind of sports is mixed, but the girls are separated from the boys in a closed place and the girls’ coach is a woman? A: This is permissible since the coach is a woman and the girls are trained at a separated place, in which no man can see them. Q: Is the natural Kohl that is put inside the eye considered a makeup that is deemed prohibited? A: It is not prohibited if it is not too obvious. 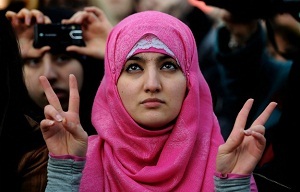 Q: I am a young girl, I live in Europe and I follow the authority of Your Eminence. I want to know if it is permissible for a woman to wear an ornament such as a necklace, or a wedding ring when she is outdoors or in school. A: There is no objection to wearing the ornaments of the face and hands in case these ornaments are not considered indecent as in the case of too much makeup which is deemed prohibited. Q: Is it permissible for the TV show host or the newscaster, whether a man or a woman, to put on makeup when he/she appears in front of the camera? A: It is permissible for a woman in case the makeup is not obvious and not considered an ornament. It is also permissible for a man if it does not lead to disgracing him. Q: Is it permissible for the woman to put some light cosmetics such as powder and Kohl (eyeliner) in public places such as malls, markets and universities? A: It is permissible for the woman to put some cosmetics that are not so obvious, do not attract others’ attention and are not considered as make up. It is not prohibited to put a little amount of such cosmetics. However, it is better for her to avoid doing so. Q: Is it prohibited to mark the skin with tattoo? A: The tattoo is not prohibited by itself, whether, for the man or for the woman. However, if the tattoo is considered an ornament that draws the attention, then, it is prohibited for the woman to mark it on her body parts (face, hands, and feet) which is not obligatory for her to cover. Also, the tattoo is prohibited in case it is marked on these parts with a thick material that covers the surface of the skin and thus, prevents water from passing on to the skin and makes the Wudhu, Ghusul, and prayer void. Anyway, it is better for the pious man/woman to leave such things because they do not fit our Islamic traditions and cultures. Q: I want to put lenses because I knew that it is permissible to put them. Do my parents have the right to prevent me from putting them? A: It is permissible to put lenses in case they are not considered an exciting ornament, and you should obey your father when he does not want you to do so for your interest. Q: One of our sisters in Islam puts cosmetics (foundation cream, lipstick, kohl (eyeliner), and colorful eye shadows) when she goes outdoors whether to work, to the university or to any other place and she says that the amount of makeup which she puts is very little. What is the ruling on this issue? A: It is prohibited for a woman to put excessive make up in front of any man other than Maharim (One’s immediate relatives - according to a certain classification detailed in Sharia law), whereas, it is permissible for her to put a little amount of makeup that is not so obvious. Q: I would like to know if it is permissible for a woman to delineate her eyebrows for her husband, since, some of our Sunni sisters cite a Hadith to show that this is prohibited? Q: I would like to know if it is permissible for a woman to plant artificial hair in order to strengthen her natural hair. Q: What is your opinion concerning the several kinds of incense that are used, especially by woman for the purpose of seeking refugee from envy, although there are many charms, supplications and Quranic verses that prevent the evil of envy.. is it proved that the incense prevent envy? A: It is not prohibited to use incense, but, it is better for the pious person to use only the amulets that comprise the Quranic verses and supplication.